What would it be like to grow up in a restaurant? And I mean literally grow up in a restaurant, where your father is the chef, your mother is the pastry chef and all the servers give you maraschino cherries and bring you little plates of food as you sit in the dining room doing your homework. I'm fascinated by restaurants and their culture. 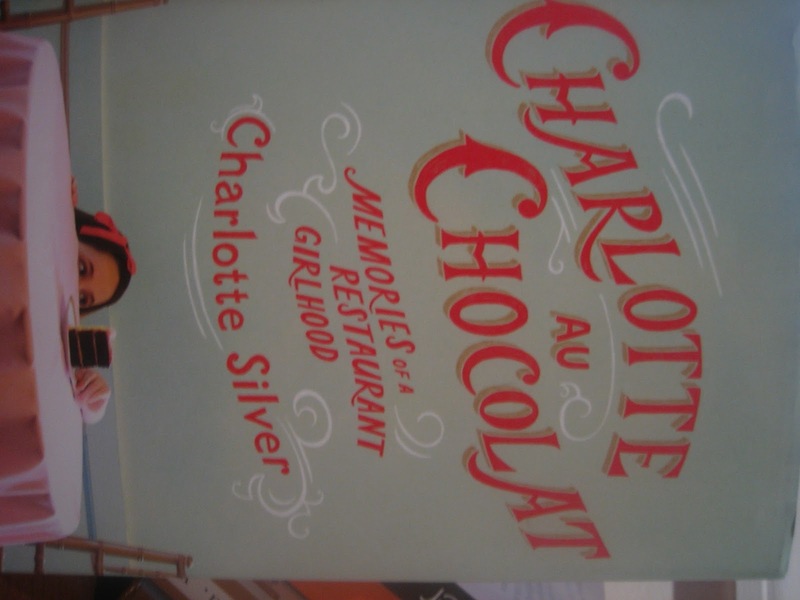 Charlotte Silver's Charlotte au Chocolat: Memories of a Restaurant Girlhood chronicles the years in which her parents and then her single mother (I'm not giving away any major plot points here, I promise) owned the restaurant Upstairs at the Pudding in Boston's Harvard Square. The restaurant, in a crumbling, Harvard-owned building, is above the famous Hasty Pudding club, which every year crowns celebrities Man and Woman of the Year and puts on a famous annual show that always features men in drag. It makes for a fascinating setting, but what is more interesting is how restaurant life is perceived through the eyes of a girl. For many chapters, it seems that she is the Alice in Wonderland of the restaurant world, crawling under tables and scaring customers, sitting in prim little party dresses for the amusement of the same customers and eating the fabulous desserts that her mother makes. School nights and normal bedtimes don't really come into consideration. When Silver described the swagged dining room with its pink accents, I couldn't help but think of a certain class of restaurants from a bygone era. For many chapters, I thought that the time frame was in the 1950s through the 1970s--up to the point where I realized that Silver was younger than me. The restaurant closed in 2001 after a lease dispute with Harvard, although a version of it reopened elsewhere--minus the unique atmosphere of the original. While Silver isn't a great writer--the book is repetitive in spots--I admit that I was fascinated by her childhood. It lacked structure and was constantly chaotic, but I wanted to be that little girl hiding under tables, stealing bites of her mother's famed charlotte au chocolate dessert, after which was was named, and speaking Spanish with the revolving cast of waiters. I wanted to be this version of Alice in Wonderland. It's a short book, but an appropriately sweet one for anyone interested in a unique perspective on restaurant culture. I've never heard of this - I'll have to check it out...sounds intriguing. This does sound like it would be good! A lot of people do not realize how much food can influence your future. I saw something on an elderly lady that makes gingerbread houses and cookies for a living. When she was young, she was intrigued at her mom's artisty of making gingerbread every year at Christmas. When she was little she always peered over the edge of the table to see her mom in action making the gingerbread house and decorated cookies. Enjoy the day! I would love to check this book out. Awesome thanks for sharing will check it out! I'm ready for a good read. Thanks! As a kid, I've always wanted to live in a restaurant as I always thought it was the perfect world. This sounds like a good read, thanks for sharing! This world fascinates us too. I think we have watched all the reality shows that deal with this culture and I love restaurant wars on Top Chef. I think we truly romanticize this life and I know that I can't imagine how difficult it must really be. Thanks for the review! I've never heard of this book before, but I'm so glad you wrote about it because I'm very intrigued! I'm going to buy it on my Nook! I've always wanted to know what it was like for someone in the family to own, run or work in a restaurant. I still wish my grandparents had opened a restaurant when they had the chance! Definitely need to grab this book, maybe it'll give me a little glimpse! :) Thanks for the write up. I like to reading thanks for sharing will check it out! The book looks interesting!! Would love to read this! Seems like an interesting book and thats a honest review you have given. I have never given a thought on what would it be like if my parents have had a restaurant. Most probably everyone in the family would have some way or rather helping out to keep it going. I think the book's title will be attracted ppl to look at it, especially with the word "Chocolate", and agreed with what Nava say. I have been looking for a "food" book and this one might just be perfect. Sounds like an interesting read. I've been lucky enough to have been in her shoes, of sorts! My grandpa owns Japanese steak Teppanyaki restaurant - he owns several restaurants in Osaka (not a chef). So I used to go to the restaurants a lot to eat and I become very picky about beef eating high quality wagyu beef growing up. I think food always interest me and also about owning restaurants etc. Thanks for the book recommendation! I think I will be like doughnut sweet and plump. Jokes apart, this book seems interesting to me. i will check if it is available on e book.